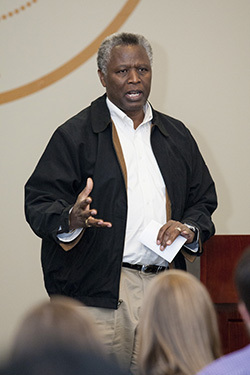 Anglican Bishop Laurent Mbanda told a Samford University audience the church is using small business techniques to help people out of the "the circle of poverty" in his African homeland of Rwanda. "The church is in the business of trying to uplift the conditions of people," said Mbanda, speaking to a gathering of students, Brock School of Business faculty and others. The Nov. 8 program was sponsored by Samford's Frances Marlin Mann Center for Ethics and Leadership. "Rwanda pushes the idea of entrepreneurship," Mbanda said, and is known as Africa's least corrupt nation. He said the nation wishes to be known as "the Singapore of Africa" because it seeks to export knowledge. "The church plays an educational development role in the economic progress of the country," Mbanda said. He described how church members would attend study groups that discussed the Bible and then talked about small business opportunities. These ranged from growing mushrooms for hotels and raising small animals such as pigs for profit to renting building space for small businesses. "There are so many groups like that," he said. "The church helps people learn how to make money and this helps transform communities," he said. Mbanda was born in Rwanda but fled with his family at the age of four to neighboring Burundi to escape an ethnic war, and spent much of his youth in a refugee settlement. "My goal growing up was to get out of that refugee camp," he said. He was eventually able to do so, and made his way to the U.S. for his college education. He earned a master's degree form Denver Seminary and Ph.D. from Trinity Evangelical Seminary. He returned to Rwanda, "believing God had done wonders in my life," in order to "give back" to his country. He worked for Compassion International ministry in Africa for 17 years before being consecrated as a bishop in the Anglican Church of Rwanda in 2010.